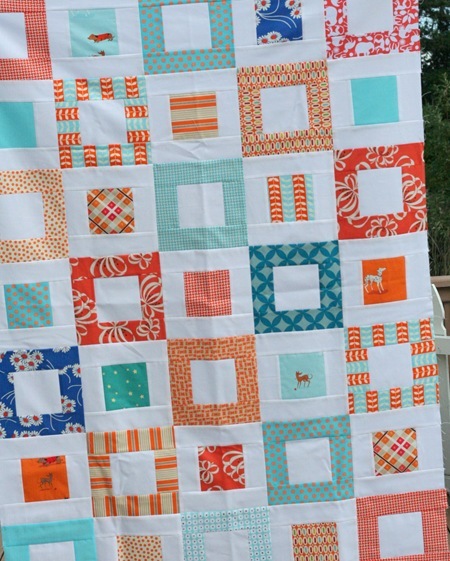 A quilt that needs ironing…..and basting and quilting and binding oh my! P.S. The pattern for this quilt can be found on my sidebar or from the link at the top that says Tutorials. Its the Orange Quilt Pattern. P.S. #2 I’ve had some questions about names of the fabrics from a couple of posts ago. If I didn’t get back to you its because I don’t know the name, but I bought them all here. Beautiful idea, beautiful quilt, and it's in my colours! :-) Love it. Aqua and orange…a favorite pairing. This is really beautiful. Honestly I probably would have never put these two colors together, but it is absolutely beautiful. This is the beauty of the internet, we can learn so much from each other. Thank you for sharing your talents with us! Yummy, thanks for the treat! Love the colors, the pretty fabric, love the quilt!! I keep coming back to this color combo – so fresh! Gorgeous! Aw man…this makes me really want to sew today and I can't. Love looking at your sewing though! I love the white material in it. It makes everything else stand out so beautifully.You have a great eye for color and materials. This is a great quilt and I love the fussy cut deer squares! 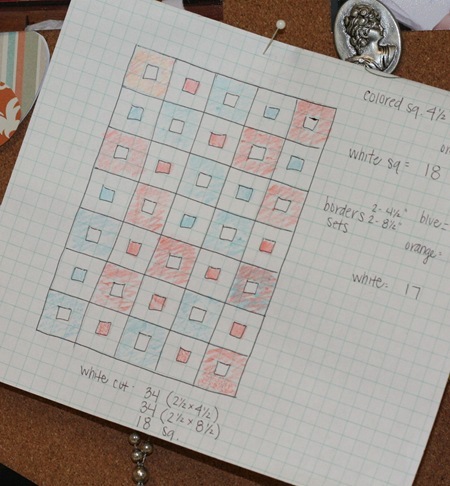 I love a quilt idea that starts on graph paper filled in with colored pencils like this! Cool quilt! I think we sometimes try to make things too complicated. I love the simple but dynamic design of this quilt. The colors and fabrics are great. I have started a similar quilt with black and white. That quilt would match my living room perfectly. You know, in case you don't have a home for it. LOVE the colors. 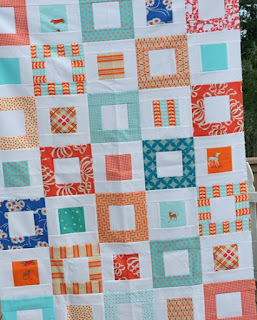 there's a quilt on the cover of one of my magazines and I was thinking of using n orange, red and aqua scheme for it. You just cinched the deal! I really love the colours, never something I would have been brave enough to put together. But it's amazing! Wow, that's a punch in the eye of color! (in a good way) Great quilt! I make and color quilt maps for mine too. Love these colors and the design! I just found your blog this weekend and I look forward to following your work! I'm starting a raw edge circles quilt inspired by your tutorial this week for a baby gift. Can't wait! Lovely! It's great to see a design come to life. That quilt must have been many hours of hard work! Wow, I love your work- beautiful job! I like the fabrics you put together in different posts, not what I'd normally gravitate to, but they are gorgeous! You have a good eye for color! …a favorite pairing. This is really beautiful.